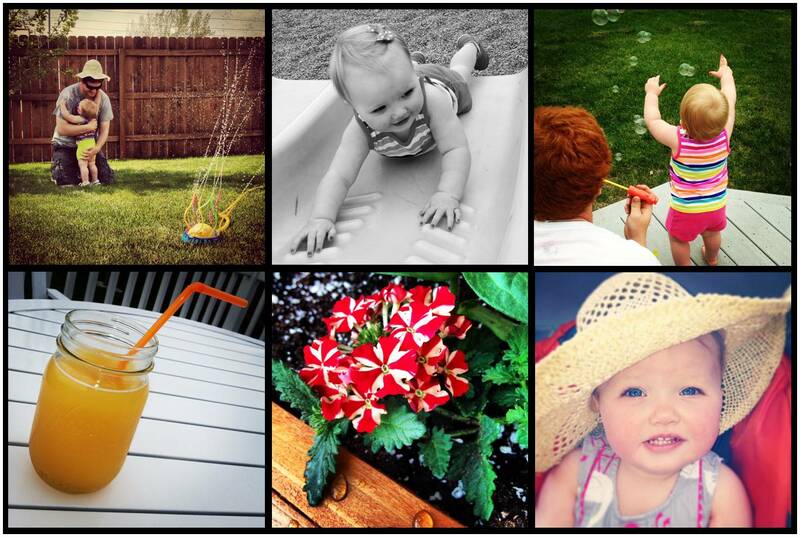 Summer 2013 took its sweet time in North Dakota, but we’re enjoying every moment of available sunshine. I keep thinking that this is Annistyn’s first summer, because she can enjoy so much more. From running barefoot around the yard to swirly-sliding at the park, it’s so much fun to watch her experience summer. Tonight I’m reflecting on how I’ve been spending my weekends. Lately, I’ve felt more at ease about housework. I do what needs to be done (i.e. laundry, clean the germy areas, buy food), but that’s about it. Thoughts of “When am I going to find time to wash my windows?” and “The fingerprint-covered stainless steel needs a good scrub…” certainly creep into my brain, but I shoo them away quickly. We’re doing what matters most. We’re putting play first. We’re blowing bubbles of wonder and savoring perfectly done ribeyes. We’re strolling through the neighborhood daily, relaxing in the warm glow of a backyard fire and sipping white mochas in the crisp morning light. Weekends are made for this, after all. How are you savoring summer? Previous Post My favorite things. Next Post Happy morning traditions. You’re correct in leaving the windows and the cleaning. They will wait. Annistyn won’t. Savor your summer days with her! Awww, sounds so sweet. I haven’t savored summer yet- life/family sometimes interferes. We’ll change that soon! We did install a bird feeder & baby swing between a couple trees last weekend, so we’re savoring sunsets with that for now. :) It’s funny, because with Ax getting into everything, I’m more organized/put away than ever! He is too destructive with a messy house! No clean windows at Casa Boman either. I love the first summer that little ones can run around and enjoy it! We’ve been visiting parks, enjoying a steady diet of otter pops and watermelon, and not getting anything accomplished. It’s fabulous!